Combine all ingredients. 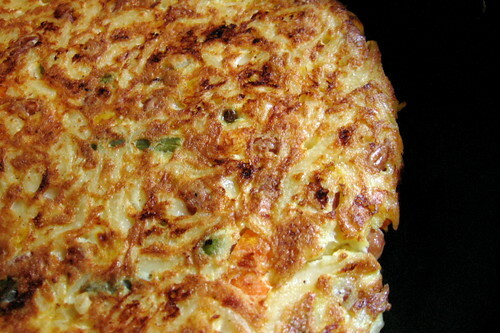 Cook in a non-stick frying pan over medium heat until the bottom is browned. Flip and continue cooking until egg is fully cooked. It’s leftover pasta — in my case, it was a leftover pasta salad that was kind of meh — plus enough eggs to make it, well, eggy plus some cheese. Cook, flip, cook, give it a highfalutin name and call it a day. Kinda wishing you had voted for the beans, huh? I got tired of waiting so I made it myself! And yes I should have voted for the beans. The comment silence on this post really speaks volumes.